Thurcroft Main Colliery and Village Web Site - Home Page. Photo's of adjacent Villages, ect. Thurcroft Village Photo's etc, 5. Thurcroft Village Photo's etc 9.
at Thurcroft, this is the same area as the cenotaph but away to one side as not to infringe on that space. An obalisk type shape approx 36 inch tall has been ordered from Clarkson Memorial of Rotherham. The wording that is to go on this monument is. IN MEMORY OF ALL WORKMEN WHO LOST THEIR LIVES AT THURCROFT MAIN COLLIERY, R,I,P. mining was a dangerous occipation. we are very grateful to the above people and committee members for their generosity and help. regards Fred Gething. 12/ 4/ 2019. 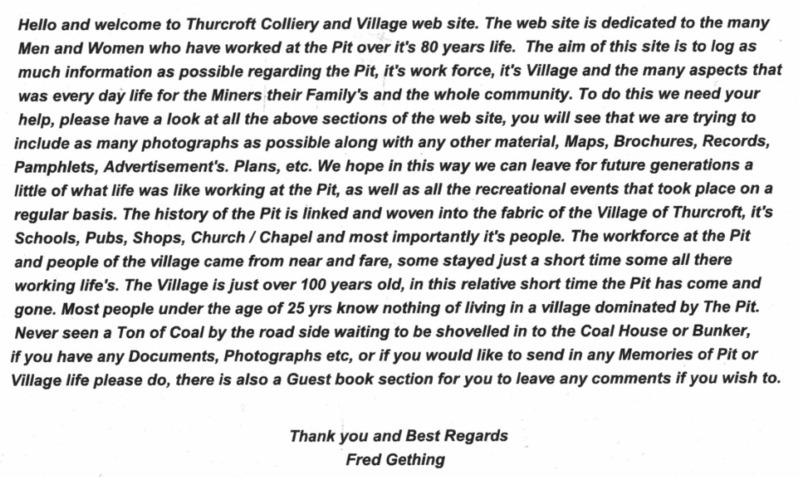 Thurcroft Colliery and Village Web Site. Sean Burk's Paper has been moved to the Links page. Thurcroft colliery Website is Copyright 2014 you need permission from the site owner to publish any materials, including photographs from the site. This website may also include links to other websites. These links are provided for your convenience to provide further information.